The Quad Cities River Bandits, Class-A Affiliate of the Houston Astros, have announced their upcoming home series April 15-17 against the Cedar Rapids Kernels will be played in Cedar Rapids due to lack of access to Modern Woodmen Park. 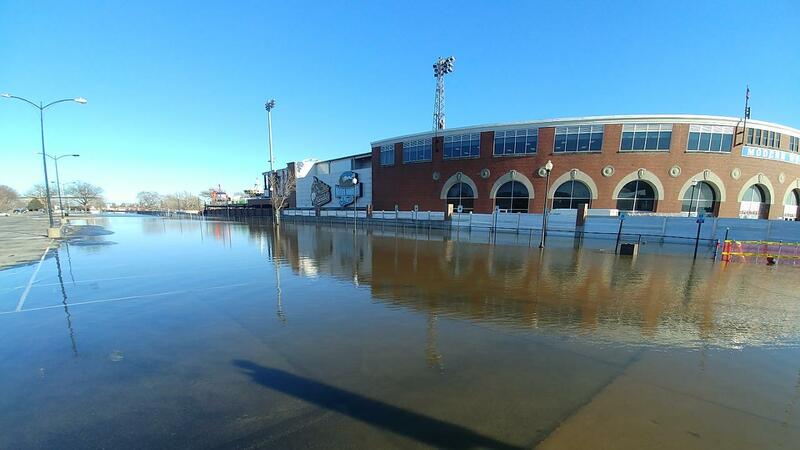 The ballpark remains unaffected by the flood waters, but the continued operation of the Canadian Pacific trains make it impossible to move players, staff, fans and equipment in and out of the ballpark safely, without exposure to the surrounding flood waters. At this time, only the first three games of the six-game homestand have been moved. The City of Davenport has yet to determine whether the River Bandits' home games scheduled for April 18-20 against Kane County at Modern Woodmen Park can be safely played. Each of the games at Veteran's Memorial Stadium in Cedar Rapids will begin at 6:35 p.m. The River Bandits will serve as the home team for the entirety of the series. All tickets for the trio of games will cost $5. Tickets will be available for online purchase and at the gate in Cedar Rapids beginning on Wednesday, April 10. River Bandits season tickets and single-game tickets for those dates will be accepted in Cedar Rapids. Fans must have those tickets in hand at the gate to gain entry. For those who cannot make the trip, single-game tickets for April 15-17 can be exchanged for a ticket to a remaining home game during the 2019 season pending availability. The River Bandits continue their season-opening road trip on Tuesday night in Clinton at 6:30 p.m.